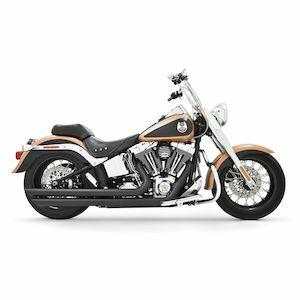 Motorcycles parts and accessories are like everything else — there are great ones, poor ones, emerging trends, and items going in and out of vogue all the time. Our ZLA Awards highlight the best of the best, but some of us wrenchy Common Tread fellas wanted to pontificate about some of the parts and accessories we got acquainted with this year. Along with the praise, we felt compelled to dole out a few holiday “turkey” awards where merited — in the spirit of the holidays, of course. ZLA has six running motorcycles that I help care for. I have five personal runners and one under construction. I also have buddies who own and build bikes. I spend a lot of time playing with motorcycle pieces. I’ve seen some interesting things this year. Let’s dish. That's a no-name chrome drag pipe sealed up to a 36-year-old Shovelhead, without a lick of exhaust gas gettin' past. 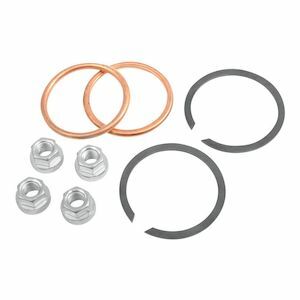 That's a tall order, and James exhaust gaskets deliver. Photo by Lemmy. I realized I must have used 15 sets of James Exhaust Gaskets on the ZLA bikes this year. On my bikes, I am snugging exhausts constantly. They always seem to loosen. James gaskets really hang tough. (I especially like their exhaust stud kit for Shovels.) Their 1984 to 2015 kit, though, is my jam. It fits every single Evo Sporty, Big Twin Evo, and Twin Cam. And they seal up great. That covers 30 years of air-cooled H-D! Amazing. Ground clearance? What's that? There's no way these pipes are appropriate for this stock-height Sportster. RevZilla photo. Next up on my list of "notable and notorious" is Freedom Performance exhaust. Man, these pipes were a major letdown for me. I installed a set of their Patriots on our house Iron 883.The chrome nameplate that was supposed to be on the pipe wasn’t installed. Then, when I put the pipes on, they were mere inches from the ground. Sure, they physically bolt up, but on a bike as low as the Iron, they’d be destroyed if you tried to ride it. I called them and mentioned this, and they basically told me that it didn’t concern them. Oh, and that name plate? They offered to send me one for me to rivet on. Can I do that? Yes. Should I have to? No. Up your game, Freedom. I award you a turkey. Call me up so I can ship it out. Vance & Hines Fuelpak FP3. RevZilla photo. I'd be remiss if I didn't mention the Vance and Hines FuelPak FP3. This is a 2014 product that’s carried its momentum through to 2015. I love this fuel tuner. I own neither a modern Harley nor a smartphone, but I wish I had both just so I could play with this product. The FP3 gives non-gearheads the ability to tinker with their bike’s performance. I envision this super-easy-to-use product turning riders into dudes with dirty hands by getting non-wrenchy types hot-rodding a two-wheeled death machine, so it’s a winner in my book. The pan material itself is of sufficient thickness to perform its task, but the seat hinge is entirely too flimsy. A Lemmy-sized fellow plus Milwaukee-sourced vibrations would spell the end of that seat hinge posthaste. RevZilla photo. Let's move on. Early in 2015, I got my hands on a few La Rosa seats and solo conversion kits. What a disappointment. The conversion bracket kits are made from metal of a thickness I would describe as "good enough." The seat hinge bracket that comes with their seats and seat conversion kits is made of the same gauge metal. It's simply too thin for that application, though. The edges of the chromed hinge that comes with the seat haven't been polished on any unit we've seen come in. Hell, they were never even deburred after they got cut. Weak. And the seat? The picture shows a nice glossy brown leather saddle. The reality? A dull, brick-red saddle with a contrasting thread color for the stitching. Try again, LaRosa. Your leather work was top-notch in the past. You’re also a big turkey. Phone me up, I’ll get one out to you. Here's the flimsy seat hinge again, but their chromed units seem to be cut with a plasma cutter or laser. The cut areas don't get polished or chromed. Look at this edge! Not only is it lacking sorely in the style department, but it's rough enough to draw blood. RevZilla photo. Battery Tender Junior. RevZilla photo. My final purchase of 2015 (well, my final planned purchase) was a Battery Tender Junior. BTJ, I love you. I have four of these running in my garage. This is a no-brainer. Even in the span of one winter, most of you have a choice: buy a battery float charger, or buy a new battery in the spring. These are significantly cheaper than most batteries. 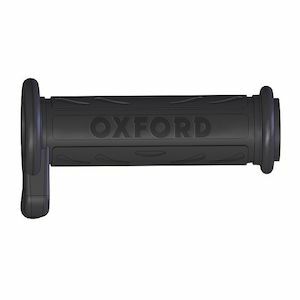 I can’t think of a single reason not to have one of these if you experience any gap in riding your bike(s). I have but a single complaint: their wall-wart design means that fitting a few of them onto one power strip or surge protector ain't happening if you don't have a fancy side-by-side plug arrangement on your power strip. I better get off the soapbox. I just returned from a trip to Nashville for a buddy’s wedding covering 2,000 miles in four days. It got me thinking about the parts and accessories I have added to my bikes this year and how they did or didn't make life better. 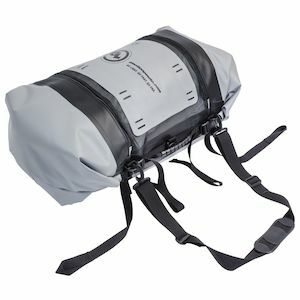 Giant Loop Columbia Dry Bag. RevZilla photo. So often we get caught up in the idea that shiny hard luggage is necessary for long hauls down the highway, but some of my best trips have utilized soft luggage. On this last trip, I used a Giant Loop Columbia Dry Bag in lieu of a top box. It offered more storage, less weight, and was completely waterproof. I also used my well-worn Firstgear Onyx Expandable Magnetic tank bag. It’s simple, affordable, and extremely functional. I was less impressed with the line of SW-Motech Quick Lock Electric tank bags I got to play with this year. Between the cost of the bag and requisite mounting ring, customers are looking at almost $400 for a tank bag. Power is provided inside the bag via an SAE lead that is inconvenient for powering most electronics, because most items needing power require some derivative of a USB cable. There goes a few more bucks for an adapter! I would recommend saving your money, and just running a power cord from an auxiliary source into a standard tank bag. SW-Motech, claim your turkey. 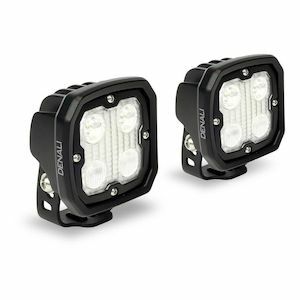 As far as lighting is concerned, I like the Denali D4 Flood and Spotlight Hybrid LED Lighting Kit. They’re half flood lights, half spot lights. These babies do a fantastic job of making sure you can see where you are headed. Denali also does a great job of offering mounting options ranging from universal setups to bike-specific light rails. Canned peaches. Spurgeon likes all that fancy electronic bushwah in his "power distribution modules." Lemmy's a bit simpler. This Rivco unit serves as the electrical hub on a Shovel chopper. It's simple, compact, offers a variety of mounting options, and the price cannot be beat. Photo by Lemmy. Added electrical accessories increase the chances of wiring nightmares. Power distribution hubs are a quick remedy. I would avoid the Denali PowerHub2, because it closely resembled Thanksgiving food. The PowerHub2 is a glorified fuse box that uses traditional fuses. It’s held together with the equivalent of a fancy rubber band. It’s not that it won’t get the job done, it’s just that there are better options available. 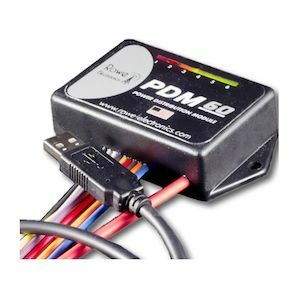 Take a look instead at the Rowe Electronics PDM60. The PDM60 acts as a circuit breaker, featuring six different circuits that can be programmed via a computer to handle a total of 60 amps. You’ll no longer have to carry spare fuses. Instead, cycle your bike’s ignition off and on and you’ll be set to roll. 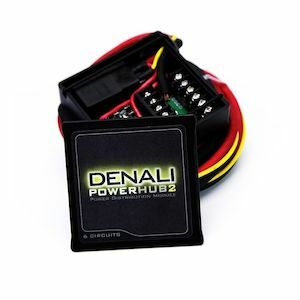 The Denali PowerHub2. Is this a killer way to start farkling up your bike, or a needlessly complex box with a rubber band holding it together? Spurg and Buzzsaw duke it out. RevZilla photo. 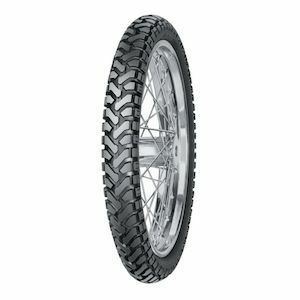 Mitas E-07 tires. RevZilla photo. I also love my tires, a set of Mitas E-07 skins I installed this summer. I have logged more than 6,000 miles on my current set and roughly 40 percent of the tread remains. While I originally bought them based on their promise of increased off-road prowess (which they deliver in spades), it is the confidence they inspire on the road that really impresses me. I had no concerns throwing my Triumph Tiger 800 through the twists and turns of North Carolina and Virginia's mountain passes. That’s impressive performance from a 50/50 tire. For me, this was the most impressive tire update of the year. 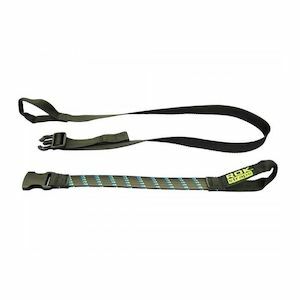 Finally, ROK Straps. Buy them. You’ll use them. We did a review of these, and they just work. (Even curmudgeonly Lemmy became a convert this year.) In terms of bang-for-the-buck, these could be the product of the year for me. My purchases usually fall into two buckets: safety and convenience. Those are the main reasons I bought my Triumph Tiger 1050. I want to comfortably enjoy riding all day and carry items easily in hard bags. I also wanted a bike with ABS (safety) and fuel injection (convenience). In spite of how much I love this bike, everything in life can be improved. My Tiger’s feeble "meep meep" horn was first on my replacement list. It was replaced by a Denali SoundBomb Air Horn. 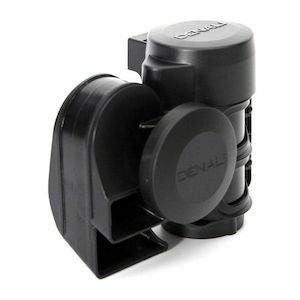 Denali provides mounts and wiring options and a split system that mounts the horn and compressor separately. It may be overkill, but nothing makes a soccer mom texting merrily away in her three-ton Suburban refocus her attention like the SoundBomb. I don’t overuse it, but sometimes riding in Philly demands an attention-getter. Buzzsaw uses his soundbomb for alerting motorists to his presence, and to scare the daylights out of Lemmy in the ZLA parking lot. RevZilla photo. You know what else I like in addition to being heard? Being seen. And I'm not talking about all my lavish nights out on the town. Lemmy and I were recently both on a lighting upgrade research kick. He scored some cheap $20 LED drop-in replacement bulbs for testing purposes. They spent a grand total of four minutes in his bike because they offered such weak light. What did we learn? That Lemmy is a cheap idiot. 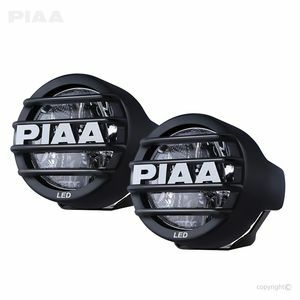 Buzzsaw's PIAA LED lights are great for seeing - and being seen! RevZilla photo. Instead, I swear by my PIAA auxiliary LED lights. The Tiger, like many bikes, is woefully under-equipped in the lighting department, with a single H7 halogen low-beam bulb. I don’t know if it’s the unconventional arrangement of the lights that catches motorists' eyes or if it’s the difference in light color temperature, but it seems as though the oncoming traffic now sees me. I get the added benefit of better depth of light down the road. Because LEDs have such a low power draw, I no longer worry about taxing the Tiger’s modest power output. Stay away from those cheap junkers Lemmy bought, though. The good ones are expensive because they dissipate heat well to keep the lumens up and retain long life. You get what you pay for. Fly-by-night bulb company, I offer you a turkey. I may have gone a bit overboard with electrical farkling. After adding phone and GPS power ports and heated grips, my battery was starting to look like a fire hazard. 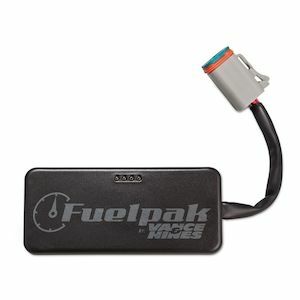 I bought the Denali Power Distribution Module that Spurgeon doesn’t care for. I think he's dotty; this thing is great! It’s got a super-beefy, 10-gauge positive and negative cable to tie into the battery. I like that it uses simple fuses for each item added, because I can easily find those at just about any gas station across the country. The Rowe PDM is $70 more expensive. That buys a lot of fuses! The module allows each circuit to be ignition-controlled or constantly hot. It has a small footprint, making it relatively easy to find a place on the bike for the unit to live. Spurg, I’ll grant you that it is a glorified fuse box, but isn’t that exactly what most motorcyclists adding acessories need? 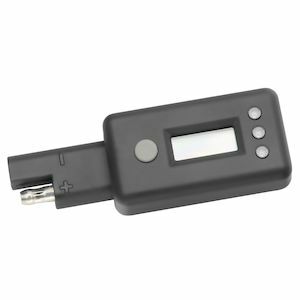 Battery Tender Digital Voltage Meter. RevZilla photo. The last item that I think every motorcyclist should have next to their battery maintainer and bottle of fuel stabilizer is a Battery Tender Digital Volt Meter. It’s a simple way to quickly check your battery’s health. Yes, a multimeter will do the same thing, but this little device will tell you everything you need to know about your battery and basics of your charging system in less than 10 seconds. I can’t even walk to the toolbox that fast.